To paraphrase Benjamin Franklin, in this world nothing can be said to be certain, except death and taxes and perhaps the Irish pub. From Ulan Bator to Union Street, you will find the unofficial emblem of Ireland—the Irish pub. 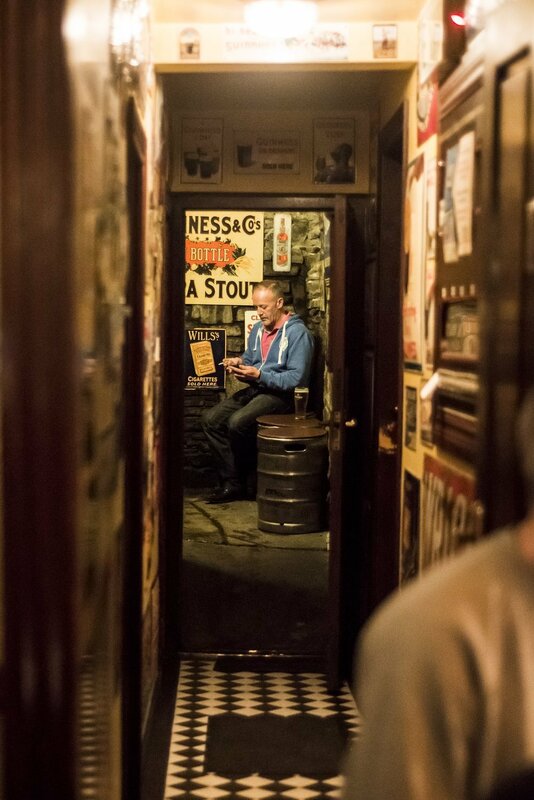 With its unique atmosphere, a guaranteed warm welcome, and the serving of a national icon—a pint of plain or Guinness—visitors will get an idea of the role of the pub in Irish society. When I first came to Connemara nearly a decade ago, I wrote down my initial impressions of the first pub I visited. ‘ … slightly tarnished road signs announcing the distance to Dublin jostling for space with lovely black-and-white photographs of a Connemara of the past. Over the front of the bar are selections of (I think) agricultural tools, which look vaguely menacing, along with a watermarked picture of W. B. Yeats. ‘Sitting across the other side of the bar are three elderly men having an animated conversation about the various merits of sheepdogs, and next to them, looking slightly bewildered and gazing at a map neatly laid out on his table, a coffee-drinking tourist is planning his next move. One of the barmaids is busily hefting logs, some only slightly smaller than her, into a roaring, open fire. I am pleased to report that not a lot has changed, although the dreaded fruit machine is beginning to make an unwelcome appearance in some quarters. Now, on to a more important matter: the proper pint. A perfect pint of Guinness will have a dark ruby colour and a creamy head of foam on top. To get the head just right, the barman or maid fills the glass about three-quarters of the way, lets it settle for a few minutes, and then carefully tops it up. If a pint of plain is not your thing, or you’re just feeling adventurous, Guinness cocktails are also popular. The Black Velvet (Guinness and champagne) is a classic, and other interesting concoctions include the Trojan Horse (Guinness and cola), the Guinness Shandy (Guinness and lemonade), and the Midnight (Guinness with a measure of Port). All pubs adhere to licensing laws that date back to British times; they are sometimes seen as a legacy of the Eight Hundred Years of Oppression. In light of this, after-hours drinking is seen as an act of quiet patriotism. Years ago, the traditional afternoon closing of pubs was known as ‘holy hour’, after a church observance popular with Catholics. Drinkers who managed to avoid leaving a pub during the afternoon closing hours were said to be ‘doing the holy hour’, although sadly this was never a defence accepted by the courts. Ireland has always been blessed with sweet-sounding lyrical music, and one of the most welcoming sounds as you open any pub door are strains of live music coming from within. 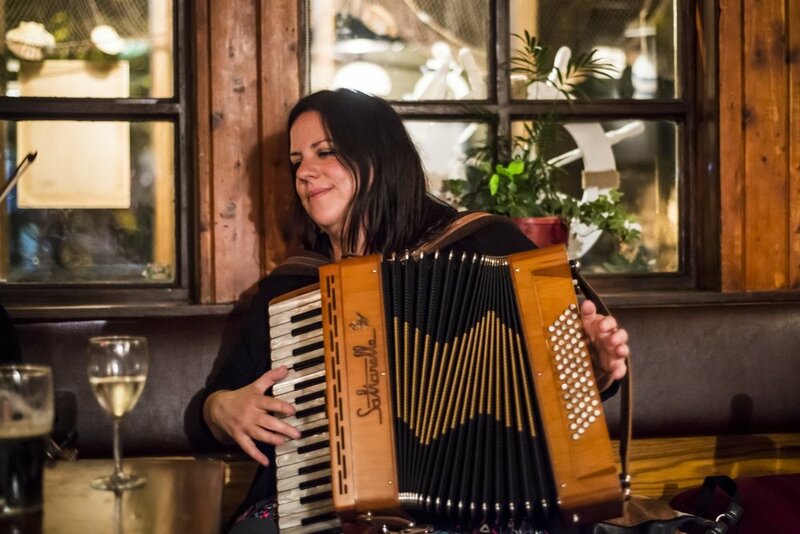 Traditional music has always been an important part of the pub experience and is a cornerstone of Irish culture. An integral part of ‘trad’ is ‘the session’, when musicians meet up in a pub to play. To the uninitiated, myself included, it looks very informal, but the traditional session is a minefield of etiquette. The first rule of the session is that the music must be traditional. Sadly, there are no helpful definitions explaining what traditional means. This is because the understanding of what is or indeed not traditional has been passed on orally or telepathically, like the music itself, from generation to generation, but never in such a form that it could land in the hands of the authorities. Experienced players can tell a nontraditional tune just from its rhythm and feel—or sometimes from its aroma, if their senses are particularly developed. In certain parts of Connemara, disputes on what is traditional may be referred to bearded holy men who ensure that the music is played in accordance with rules laid down in the dim and distant past. Traditional instruments include the fiddle, the tin whistle, and the flute. Nontraditional instruments include the guitar, the oboe, and the trombone. However, the bodhrán (a one-sided drum made from goat skin) is now often seen in sessions and tolerated (at least publically). Musicians may express their disapproval in a variety of subtle ways, such as getting up and leaving. Singing is acceptable at a session providing it is of the traditional variety known as sean-nós (pronounced shan noce). This usually means that the song should tell a story and preferably be in Irish. It should also have at least fifty verses or go on all night—whichever is longer. Ballad singing is frowned upon, and group sing-alongs will usually result in ejection from the premises. However long they take, sean-nós songs must be heard in rapt silence, except during the pauses between verses, when listeners may shout encouragement in the manner of worshippers in an Alabama Baptist church. Sometimes during a session you will come across some Irish dancing. There are two main kinds of Irish dancing: Riverdance, the stage spectacular, which at one time was running in more cities than a faulty faucet; and Real Irish Dancing. The latter has many similarities to Riverdance but exists mainly in a competitive format. The observant among you will notice other differences, such as, in Real Irish Dancing, men do not wear frilly blouses and dancers may not express themselves (except in a written note to the adjudicators). Until 1994 there was only Real Irish Dancing. Unlike most national dance forms, such as the tango and flamenco, it had no sexual undertones at all. All traces of sensuality had been carefully removed by the combined effects of competition and the strict Catholic upbringing to which most dancers were subjected. Arms were held rigidly by the sides, as if glued there. Backs were even more rigid, and excessive Elvis-type hip movements would be punished by loss of marks or —in extreme cases—excommunication from the Church. Things have changed, however. Twenty-first-century Real Irish Dancing seems to have slowly evolved: its long-repressed sexuality is now smouldering, and competition organisers now have fire marshals at all venues, just in case. Now I must away, for I hear the clarion call of a pint being poured and my foot is beginning to tap to the sound of a man playing a fiddle.